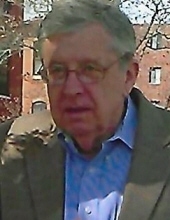 WILLIAM PAULETT, Age 72. Beloved husband of the late JoAnn M. (nee Sobocinski); loving father of Krista McGuire (Jerry), Rebecca, Steven (deceased), Matthew (Lindsay) and Jill; grandfather of Ally (Nick), Rachel, Bridget, Ryan, Madeline Jacobson (Nick), Aiden, Kylie, Owen and Riley; great grandfather of Sullivan “Sully Mac” Sanka; son of the late Thomas and Ann Marjorie; brother of Tim (deceased), Carol Anne Anders, Kitty Butler (Ed), John (Maureen), Mary Ellen Hartman (Dave), Barb Long (Dave) and Jim (June); dearest friend of Tim and Rosemary Zak; uncle, great uncle and cousin of many. U.S. Air Force Vietnam Veteran. Passed away Monday, September 24, 2018. Funeral Mass Our Lady of Angels Church 3644 Rocky River Dr. Saturday, September 29 at 10:00 a.m. Private interment All Saints Cemetery. Friends may call at THE McGORRAY-HANNA FUNERAL HOME OF WESTLAKE 25620 CENTER RIDGE RD. (WEST OF COLUMBIA) FRIDAY 4-8 P.M. In lieu of flowers the family suggests memorial contributions to Walk to End Alzheimer’s, act.alz.org, team name Wandering with William. "Email Address" would like to share the life celebration of WILLIAM PAULETT. Click on the "link" to go to share a favorite memory or leave a condolence message for the family.